Scitation Description of this database. Contains approximately 600,000 articles from more than 110 technical publications in the physical sciences. Citations and abstracts come from 18 STM publishers (AIP, APS, ASCE, ASME, SPIE, and other science and engineering societies) Users must first register, which is free. Maintained by the American Institute of Physics (AIP). Physical Review Online Archive (PROLA/APS) Description of this database. Physical Review Online Archive (PROLA) is the American Physical Society's online archive for Physical Review Letters, Reviews of Modern Physics, and Physical Review A–E. SciTech Connect Description of this database. Contains documents and citations in physics, chemistry, materials, biology, environmental sciences, energy technologies, engineering, computer and information science, renewable energy, and other topics of interest related to DOE's mission. In this concise and self-contained book based on his online Yale course, Professor R. Shankar explains the fundamental concepts of physics from Galileo's and Newton's discoveries to the twentieth-century's revolutionary ideas on relativity and quantum mechanics. The book begins at the simplest level, develops the basics, and reinforces fundamentals, ensuring a solid foundation in the principles and methods of physics. This book provides solved problems related to Classical Mechanics and Electricity and Electromagnetism. Chapters begin with a summary, necessary formulas and Line diagrams followed by a variety of typical problems useful for assignments and exams. Detailed solutions are provided at the end of each chapter. Handbook of Physics is a veritable toolbox for rapid access to a wealth of physics information for everyday use in problem solving, homework, and examinations. This complete reference includes not only the fundamental formulas of physics but also experimental methods used in practice. "This book provides visualizations of many topics in general physics. The aim is to have an interactive MATLAB script wherein the user can vary parameters in a specific problem and then immediately see the outcome by way of dynamic "movies" of the response of the system in question. MATLAB tools are used throughout and the software scripts accompany the text in symbolic mathematics, classical mechanics, electromagnetism, waves and optics, gases and fluid flow, quantum mechanics, special and general relativity, and astrophysics and cosmology. The emphasis is on building up an intuition by running many different parametric choices chosen actively by the user and watching the subsequent behavior of the system." This book provides a chronological introduction to the sciences of astronomy and cosmology based on the reading and analysis of significant selections from classic texts, such as Ptolemy's The Almagest, Kepler's Epitome of Copernican Astronomy, Shapley's Galaxies and Lemaître's The Primeval Atom. Each chapter begins with a short introduction followed by a reading selection. Carefully crafted study questions draw out key points in the text and focus the reader's attention on the author's methods, analysis, and conclusions. Numerical and observational exercises at the end of each chapter test the reader's ability to understand and apply key concepts from the text. The Heavens and the Earth is the first of four volumes. This book provides a chronological introduction to the science of motion and rest based on the reading and analysis of significant portions of Galileo's Dialogues Concerning Two New Sciences, Pascal's Treatise on the Equilibrium of Fluids and the Weight of the Mass of Air, Newton's Mathematical Principles of Natural Philosophy, and Einstein's Relativity. Each chapter begins with a short introduction followed by a reading selection. Carefully crafted study questions draw out key points in the text and focus the reader's attention on the author's methods, analysis, and conclusions. Numerical and laboratory exercises at the end of each chapter test the reader's ability to understand and apply key concepts from the text. Space, Time and Motion is the second of four volumes. "Basic Concepts in Physics: From the Cosmos to Quarks" gives an accessible and eminently readable introduction to all the main ideas of modern physics. The first five chapters are devoted to classical physics, from planetary motion to special relativity, always keeping in mind its relevance to questions of contemporary interest. The next six chapters deal mainly with newer developments in physics, from quantum theory and general relativity to grand unified theories, and the book concludes by discussing the role of physics in living systems. A basic grounding in mathematics is required of the reader, but technicalities are avoided as far as possible; thus complex calculations are omitted so long as the essential ideas remain clear. 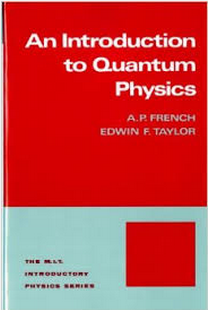 Preferred by some over Griffiths' "Introduction to Quantum Mechanics" for it's mathematical presentation. This edition of "Introduction to Quantum Mechanics" also includes a new chapter on the revolutionary topic of of quantum computing. One of the most popular and most recommended introductory quantum mechanics texts, this book first teaches learners how to do quantum mechanics, and then provides them with a more insightful discussion of what it means. Fundamental principles are covered, quantum theory presented, and special techniques developed for attacking realistic problems. Topics in Volume III (Quantum Mechanics) of Feynman's legendary lectures include quantum behavior, wave/particle duality, Bose particles, Fermi particles, two-state systems, the Hamiltonian matrix, symmetry and conservation laws, and more. This classic is considered by many to be an important companion to more "modern" introductory texts on Quantum Mechanics. Very readable, conceptually descriptive and (a happy thing for those approaching this for the first time) lighter on math than most of its more modern companions. Here is an unparalleled modern handbook with comprehensive contents spanning: animal acoustics including infrasound and ultrasound, environmental noise control, music and human speech and singing, physiological and psychological acoustics, architectural acoustics, physical and engineering acoustics, medical acoustics and ocean acoustics. The Springer Handbook of Acoustics reviews the most important areas of acoustics, with emphasis on current research. Each chapter is richly illustrated with figures and tables. This collection of formulas has been written by applied scientists and industrial engineers for design professionals and students who work in engineering acoustics. In addition to formulas, useful principles and computational procedures are given. Review articles which offer in-depth treatment of a research area, surveying recent work, and providing an introduction aimed at graduate students and nonspecialists. The journal's shorter Colloquia describe recent work of interest to all, especially work at the frontiers of physics, which may impact several different subfields [From the publisher]. Content reflects core physics disciplines as well as topics whose central theme falls within the bounds of physics. Each Report reviews one specific, physics-related subject. These reviews are specialist in nature but contain enough introductory material to make the main points intelligible to a non-specialist. The American Physical Society’s highly selective, online-only, fully open access journal which publishes key papers from all areas of pure, applied, and interdisciplinary physics. Comprehensive articles on nanoscience and nanotechnology research related to the synthesis, assembly, characterization, theory, and simulation of nanostructures (nanomaterials and assemblies, nanodevices, and self-assembled structures), nanobiotechnology, nanofabrication, methods and tools for nanoscience and nanotechnology, and self- and directed-assembly. The world’s premier physics letter journal publishing short, high quality reports of significant and notable results in the full arc of fundamental and interdisciplinary physics research [From the publisher]. Applied Physics B covers the broad field of laser physics, linear and nonlinear optics, ultrafast phenomena, photonic devices, optical and laser materials, quantum optics, laser spectroscopy of atoms, molecules and clusters as well as the use of laser radiation in biophotonics, chemistry and biochemistry.